Legendary Minnesota Twins outfielder Tony Oliva recently made an appearance in New York City at a baseball card show. Oliva, who just had a statue dedicated to himself at Target Field on opening day, took some time to reflect on his 50 years with the organization. Long after he has retired his glove and spikes, at age 72 Tony Oliva still dreams about his baseball career. Born in 1938 in Pinar del Rio, Cuba, Oliva went on to achieve major league stardom after humble beginnings growing up on the farm. As a young man, Oliva simply desired to follow in the footsteps of the Cubans that preceded him and play baseball. He never thought he would have experienced this journey. 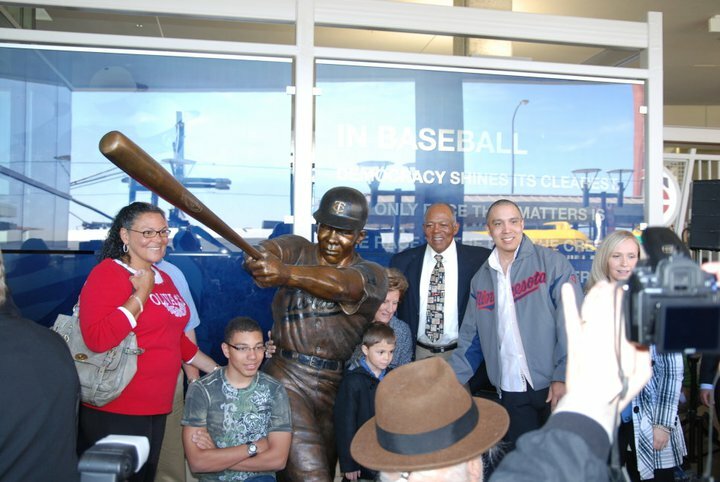 Just a few weeks ago, Oliva had another dream come true when the Minnesota Twins unveiled a statue of his likeness outside of Gate Six on opening day at Target Field. “Can you believe that? It's in Gate #6, which was my number. I tell people, you never know, from the farm in Cuba to having a statue of you in front of the big league stadium. It’s unbelievable,” Oliva glowingly said during a recent appearance in New York City. Returning to New York for the first time in many years brought back vivid memories of playing in the city for the eight-time All-Star. Brought to legendary scout “Papa” Joe Cambria by Roberto Fernandez Tapanes in 1960, Oliva made the journey from Cuba through Mexico to the United States to make his debut with Class-D Wytheville of the Appalachian League in 1961. Oliva tore through the league, batting an astounding .410, and after hitting .350 at Class-A Charlotte the following season, he was summoned to the major leagues for a late September call-up. He played 15 seasons for the Twins, winning three batting titles in the American League in addition to his aforementioned eight All-Star appearances. Now working as a special assistant for the team, 2011 marks the 50th year that Oliva has been involved in the Twins organization as a player, coach, and administrator. He is still amazed that he is with the same team he started with a half-century ago. He expressed gratitude for the Twins ownership of the opportunities that he has received. “Mr. Griffith for me was part of the family, like a second father," he said. "He did something for me that I will never forget. When I finished playing as a regular, he called me in and told me, ‘I want you to be in the organization as long as you want. I want you to be my hitting coach. How much do you want to make?’” Griffth asked Oliva. “I knew how much the coaches were making; the coaches don't make nothing. I told him, 'Give me what you think is the right amount.'" Oliva was more than satisfied with Griffith's response. As one of the proud faces of the franchise, Oliva has embraced his role as an ambassador for the club.